It occurred to me a little while back that I am doing much less spontaneous tatting than I used to. By spontaneous, I mean seeing something and just deciding to make it. Just for fun. The last couple of years or so, I've done so much starting big projects, or starting projects with the fair or some other purpose in mind. I think I need to lighten up and do more tatting on a whim. An excellent opportunity for this was making one of a series of snowflakes shared by Sharon B on her blog. Over the past few months, she has generously shared 26 snowflake patterns in diagram form. Click HERE for a post with a picture of all of them and links for all the patterns. Thank you, Sharon. I know what you mean, I feel the same about the ice drops I've recently tatted. 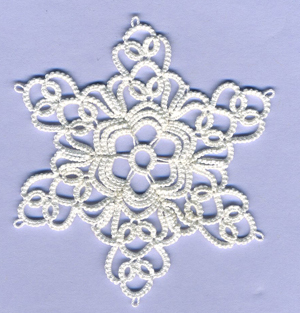 Sharon's snowflakes are splendid, good job your spontaneous tatting. Looks great! I spent the day doing whim tatting yesterday and it felt great! Me too! Too much planning and not enough “just for fun” stuff. I love Sharon’s snowflakes - what a generous gift to all of us.